My cooking routine has gotten to be a little… routine lately, so I headed to the store downstairs to see what I could find to liven up some chicken. I was looking for teriyaki sauce, but they didn’t have any. Barbecue was the next best option. 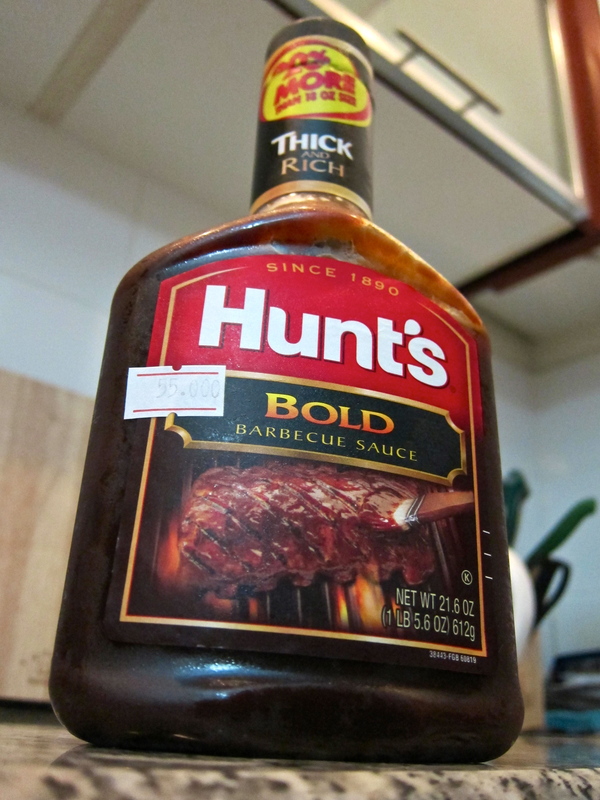 It’s Hunt’s BOLD Barbecue Sauce. I can tell it’s imported because it says you get 20% more than the 18 oz. size. 55,000 VND sounds like a lot of money for a bottle of barbecue sauce, but it’s actually less than $3. And, considering how far it’s come and that it’s 20% more, it was quite a bargain. Back upstairs, I turn on itunes genius for some music to keep me company as I cook. Chopping the chicken, I hear Alison Krauss singing about my hometown. Her voice already has that certain quality that pricks at my heart, straddling that strange musical line between pleasure and pain, and when she starts singing about Atlanta, I can’t help but go home in my mind. It’s not a perfect city, but it’s where I’m from. I miss it sometimes. I think about my sister’s upcoming wedding and my friends’ growing children who won’t know me next time I come home. At about the same time, I twist the cap on the barbecue sauce, breaking the paper wrapper and freeing the sweet, spicy smell. My mouth starts watering, and I have to blink rapidly to keep my eyes from following. (Not that he would be surprised, but I don’t want to have to explain to Jonathan why barbecue sauce and Alison Krauss are making me cry.) I think about the last time I had barbecue. It was in Atlanta. When I was home in May, I visited my old landlord and landlady who also happen to be very good friends of mine. Peanut Jones was born in March so Landlady, Esq. is on maternity leave. This free time enabled us to take advantage of the new Atlanta Street Food Coalition. I’ve mentioned before how much I love the street food in Saigon. It’s everywhere. It’s tough to find a street that doesn’t have a cart selling something – whether it’s a café sua da or a fried banana. So, the thought of having this in Atlanta pleases me immensely. Since this is a fairly new endeavor, the choices are limited. We checked the schedule to see what was nearby, and I was again immensely pleased to find that barbecue was on the menu. Slow-smoked, pulled-pork style. Barbecue is common in Asia, but it always means something else. 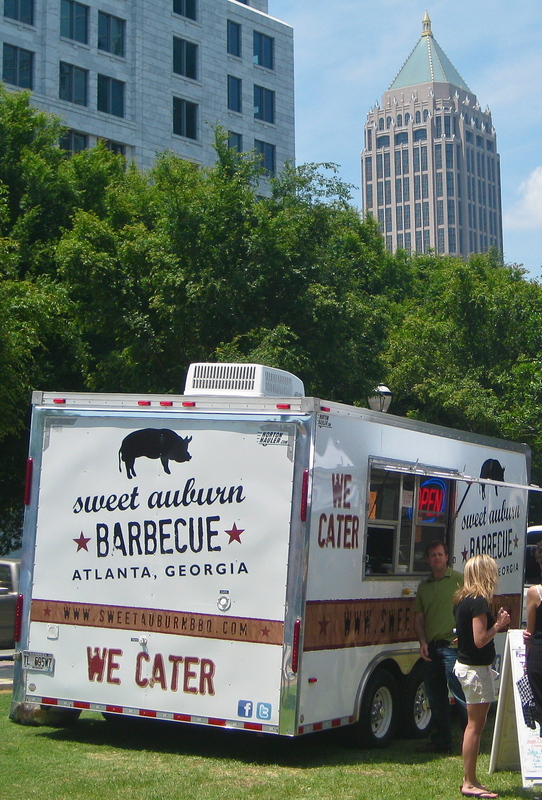 So, we headed to the Sweet Auburn Barbecue van on the corner of 10th and Peachtree Street. It is a far cry from what I’m used to. The background is skyscrapers instead of French style, communist buildings. The combos cost $8. We had to drive in a car to get there (a hybrid, no less.) And, most of the other customers were in some sort of business-wear. No pajamas, flip-flops, or cone hats to be seen. 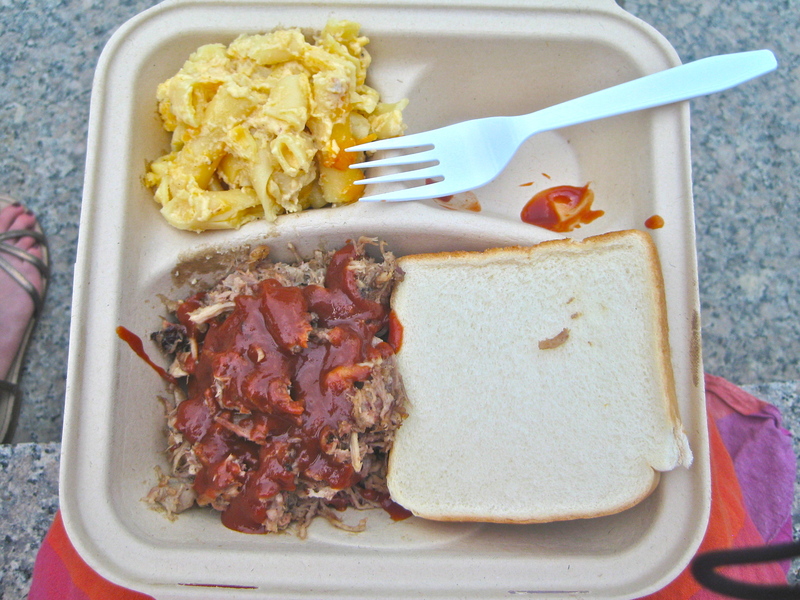 I had a pulled pork sandwich, strawberry lemonade, and macaroni and cheese. And, not the stuff out of a box. This was the real cheesy deal. The kind your mama makes – if you have a good mama anyway. I didn’t have to wonder whether the ice in my lemonade had a hole in it (manufactured and thereby purified) or was hacked of a huge block of questionable origin. Some things don’t change though. We ate our lunches sitting on a step under the sun. Actually, I ate while Molly pushed Peanut’s stroller back and forth. Then we switched. Evidently he wasn’t in the mood for barbeque. Now I know, next time I want to go home, all I need is Alison Krauss and some Hunt’s barbecue sauce. What smells or sounds bring back the most distinct memories – good or bad – to you? The unique smells and sounds of spring and summer in the rural south such as farm smells and the sweet smells of freshly cut grass and honeysucle growing wild reminds of growing up as child: playing games with my friends; swimming in a water hole; of watching honey bees busily gathering pollen; and chasing fireflies in the cooler evenings. I recently bought a jar of Marmite from the Selectmart in Vincom. And it was like a miracle jar of Marmite because usually anywhere away from Australia or New Zealand Marmite is the awful sticky sloppy British stuff, but this was proper thick dark brown pungent NZ Marmite. The kind that everybody on the planet who wasn’t forcefed the stuff as a toddler absolutely hates. The last jar I had at home lasted me about 2 years. But these things gain significance when you can’t just get them whenever you want. I read somewhere that if you don’t eat Marmite before you’re 14 you will never like it. When I lived in England I learned to enjoy it lightly scraped on buttered toast, but I remember seeing my Aussie friends squirt it from a tube into their mouths. One backpacker carried a huge stash with him. I can see how if a product can make you feel that connected to home it is probably worth carrying some around with you. I always enjoy your comments 🙂 Thank you. I’ve been seeing all these food stands on Saturdays going to watch Glenn play ball… I’ve also wanted to stop many a time, but never have.